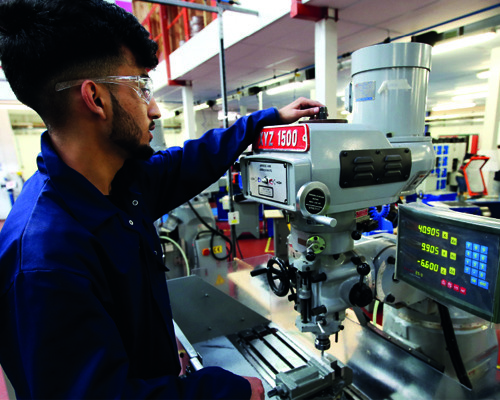 Traditional engineering is set to return to Longbridge later this month, when Bournville College launches a brand new Engineering Centre. Longbridge has a long history of engineering. In 1895, Birmingham based print company White & Pike opened a new factory on the site, making and printing tin boxes. The factory closed in 1901 and the site was bought by Herbert Austin and in 1906 the Austin factory produced its first car. Car manufacturing continued through the years with the Rover Group, MG Rover Group and MG Motor UK. Even today, the automative industry remains represented in Longbridge with MG still headquartered there, along with the company’s Design Centre and Engineering Technical Centre. There is a huge demand from employers for skills in Engineering, so if you’re looking for a vocation, Engineering is a great route to take. Bournville College’s purpose-built facility will focus on mechanical engineering, offering courses from Level 1 to Level 3 for school leavers and Access to University courses for adults. The centre will be officially opened by Northfield’s MP Richard Burden on Thursday 30th August between 5-7pm and any budding engineers are invited to attend. Mr Burden said that the new centre was exciting news for young people in Birmingham. He said: “Bournville College is a cornerstone of the regeneration of the Longbridge area and the return of traditional engineering to the area provides an opportunity to build on Longbridge’s proud engineering heritage.